Here Srila Prabhupada discusses the step-by-step process of reviving our original peaceful and happy condition, Krsna consciousness. He writes, "If we want to participate in the unlimited happiness, knowledge and eternal life which constitute our actual heritage in the spiritual world, we should not waste this life by working hard for sense gratification. We should accept a life devoted to the cultivation of Krsna consciousness, and then we will get unlimited happiness and unlimited pleasure. 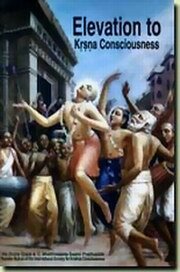 This is the sum and substance of the Krsna consciousness movement." In India all scriptures and great spiritual teachers, including Shankaracharya, an impersonalist, accept Krishna as the Supreme Lord. In the beginning of his commentary on the Bhagavad-gita, Shankaracharya says that Narayana is transcendental to this manifested and un manifested creation, and in the same commentary he says that the Supreme Personality of Godhead, Narayana, is Krishna appearing as the son of Devaki and Vasudeva. Thus in this respect there is littel difference of opinion about Krishna. Those who are authorities, be they personalist or impersonalists, are in agreement that Krishna is the Supreme Lord.